View up Threadneedle Street showing a number of offices, shops (including Irwin's Fruit Lozenge Warehouse! ), St Christopher Le Stocks Church and beyond that the new Bank of England. It was founded in 1694 as a way for the Government to raise money 'upon a Fund of Perpetual Interest'. 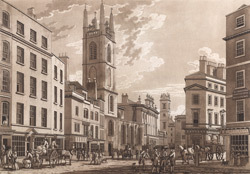 In 1734, the Bank moved to its present location in Threadneedle Street. Between 1767 and 1770 the building was extended by Sir Robert Taylor and it was reconstructed in 1788 in the neo-classical style by Sir John Soane. By the late eighteenth century it became known as 'Old Lady of Threadneedle Street'.